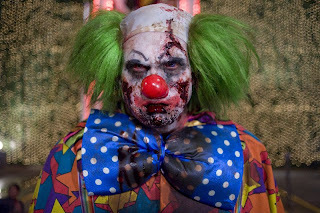 I just love Zombieland. It opens today in Malaysia, which is quite late than the release that they had in the United States but take my advise, the gore and the excitement which you feel if you watch it on the television is nothing compare to the feeling that you will feel if you watch it at the cinema. Thanks to Advertlets, managed to catch it earlier. The next part of this post will be full of spoiler. There will be no names. They just used the names like Tallahassee, Little Rock and Wichita. Oh, I forgot, the star of the movie : Columbus, who is a cowardly, nerdy, so-not-popular and loser kid, who became the unlikely hero in the movie. He was also the narrator and the one who has all these rules which you should follow if your world ever be overran by zombies. The rules start at four rules then as the movies go along, it seems that there are more than that. It was even changed accordingly to the situation. Especially if you can get the girl because of it. With no expectation, you will get a fun and funny movie. With a bit of expectation, you will get a movie with an erratic storyline, no real ending and some one-liners. The movie start off with Columbus (Jesse Eisenberg) alone, then he picked up Tallahassee (Woody Harrelson). Then they were conned by Wichita (Emma Stone) and Little Rock (Abigail Breslin), who were con-persons themselves even before the zombie apocalypse. Thrice they were conned by these girls! One part of the movie, they decided to stick together as they were heading to a safer place supposedly in the east. Then they took shelter in Hollywood and of all places they went to Bill Murray house who was in the movie as himself. That is before he git shot. Dead. Which was a hoot by itself. There were a few pop culture reference and generation gap comedy. If you chuckle and in the know, then consider yourself old. The climax was at a theme park where the girls managed to get all the zombie in one city to come to them. Bad move on their side but Columbus managed to prove his worth and get the girl in it. Watch out for the clown. "You thinks It was scary?" The credits were only given to six actors and the others were nameless zombies who got whacked one by one. No tears were shed in the watching of the film. The part with Bill Murray was funny, even when they accidentally killed him. I knew it was going to happen as soon as I saw him, but it was still funny. Taking picture or posing for a picture? Nothing bring people together like Friendsters? 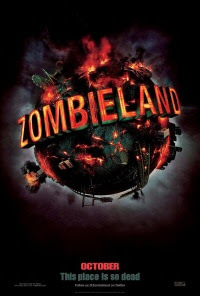 Zombieland is all about fun!